4Humanities is happy to announce that the Andrew W. Mellon Foundation has provided $1.1 million in funding for the WhatEvery1Says (WE1S) project for three years, beginning October 1, 2017. Based at University of California, Santa Barbara, with partners at California State University, Northridge, and University of Miami, the WE1S project investigates how the news media and other public sources portray the humanities. (See the UCSB news release on the Mellon award.) The project uses machine learning methods to analyze public discourse on the humanities at large data scales. The project’s hypothesis is that digital methods can help us learn new things about how news media sources portray the humanities. For example, are there sub-themes beneath the familiar dominant clichés and memes? Are there hidden connections or mismatches between the “frames” (premises, metaphors, and narratives) of those arguing for and against the humanities? How do different parts of the world or different kinds of sources compare in the way they think about the humanities? Instead of concentrating on set debates and well-worn arguments, can we exploit new approaches or surprising commonalities to advocate for the humanities in the 21st century? 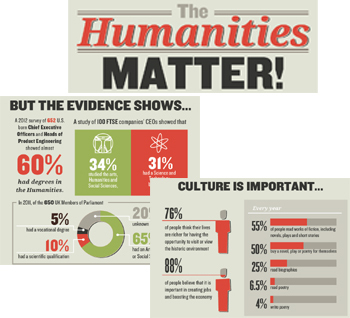 WE1S hopes to use its findings to provide advocates for the humanities with strategies and materials for effective communication about the value of humanistic study and knowledge – with narratives, arguments, scenarios, and evidence that advance, rather than simply react to, public conversation on the place of the humanities in today’s world. In the process of its work, the project is also developing tools and guidelines to create an open, generalizable, and replicable digital humanities methodology. These include a manifest schema for data-provenance and processing-steps tracking, an integrated workflow management and virtual environment, and a topic-model interpretation protocol. WE1S will make these tools available to other digital humanists engaged in research involving machine learning at large scales. This branch of the 4Humanities site is a staging ground for collaboration among digital humanists willing to contribute to “powering advocacy of the humanities” through their special expertise. Included here is the current work plan and task sheet for the site, with room for contributors to volunteer their help. A showcase of standout examples of contemporary humanities research, teaching, and contributions to society.